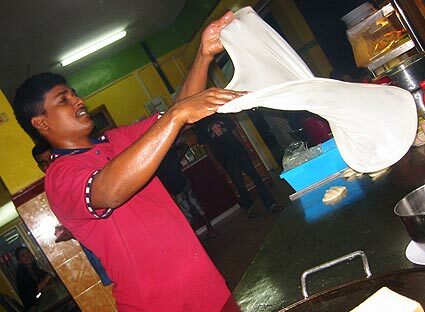 Roti Canai is a popular dish for breakfast or as a evening snack. Most Mamak stalls will stop making Roti (and Tosai) between 11am and 5pm. The making of the Roti (=the process of flattening the ball of dough) is very artistic and requires skilled hand and is worth to be observed. Roti Telur (egg), Roti Pisang (banana), Roti Boom, Roti Tissue, Roti Sardin and more. The dish is composed of dough containing copious amounts of fat, egg, flour and water. The form of fat used is usually ghee (clarified butter). Some people add sweetened condensed milk to the mix. The entire mixture is kneaded thoroughly, flattened, oiled and folded repeatedly. It is then allowed to proof and rise, and the process is repeated. The final round of preparation consists of flattening the dough ball, coating it with oil and then cooking on a flat iron skillet with a lot of oil. The ideal roti is flat, fluffy on the inside but crispy and flaky on the outside. restaurant type | Indian, Mamak Mamak stalls are restaurants in Malaysia run by Muslim Indians.